B1768. 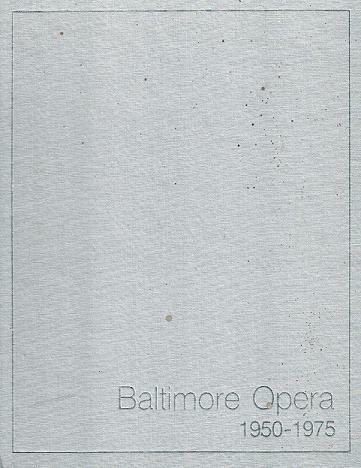 Annals of the Baltimore Opera 1950 – 1975. Baltimore, MD: Baltimore Opera Company, 1975. 96 unnumbered pages. Beautifully produced profile of the Baltimore Opera featuring numerous photos. 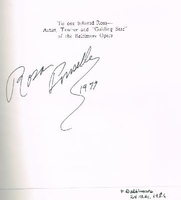 Rosa Ponselle discography; Title-page Autographed & dated 1977 by Rosa Ponselle. Numbered Copy #131 of printing limited to 3000 copies. Dedicated to Rosa Ponselle who is honored in Section II with a Biography, a Pictorial Essay and Complete Discography. Section III (Autographed by Pasatieri) is a profile of Pasatieri’s INES DE CASTRO, The Making of a World Premiere. Textblock is unmarked. Binding is tight. Boards are silver and have very light soil. “It was with AÏDA, that iconic example of theatrical grandeur and musical splendor, that Baltimore Opera's official history began at the Maryland Casualty Auditorium on Keswick Road. The 1950 production included such gifted Baltimoreans as tenor Eddy Ruhl and conductor Leigh Martinet. Two years later, the company moved into the Lyric Opera House. Baltimore Opera was the most prominent tenant there until last November, when it presented what turned out to be its swan song - a memorable staging of NORMA. One of the legendary interpreters of the title role in that work is Rosa Ponselle, who became in her post-opera career the proud godmother of the company and would go on to guide it as artistic director for a long, eventful period. 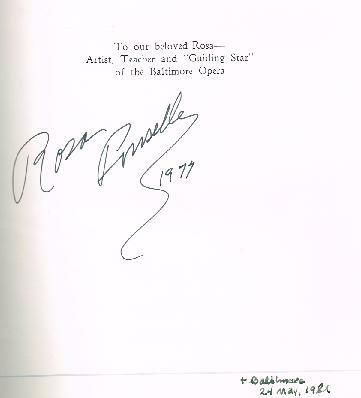 In the late 1940s, Ponselle became the guiding force of the fledgling Baltimore Civic Opera Company, providing coaching and voice lessons for the young singers who appeared with the company. Among those who coached with her during their Baltimore Civic Opera appearances at the start of their careers were Beverly Sills, Sherrill Milnes, Plácido Domingo and James Morris. Looking over the performance annals of the Baltimore Opera is a fascinating, now bittersweet, experience. The artist roster includes such luminaries as Birgit Nilsson, Beverly Sills, Plácido Domingo, Anna Moffo, Teresa Stratas, Norman Treigle, Martina Arroyo, Carlo Bergonzi, Ghena Dimitrova and Sherrill Milnes - not to mention Evelyn Lear and James Morris. Add in impressive conductors, directors and designers, and the company reveals a substantial history. Baltimore Opera did very good work."